Many people have hit a brick wall. Everyone hits a brick wall at some point. 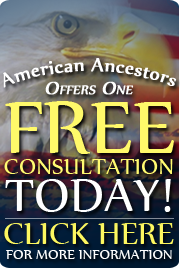 The Expert Researchers at American Ancestors are extremely experienced. other repositories a family researcher has not visited. Our Researchers are prepared to help you. and we desire to help as many as possible. All of the United States including Hawaii & Alaska. England, Scotland, Ireland, Australia, New Zealand. Or finding an individual, etc. We will attempt to answer one question or research question. really difficult research problems we will not know the answer to. To obtain our assistance please go to our “Contact Us” page. Type a brief explanation of your Research Need. dates and places of the individual. Include the full name of the Spouse and if they were married more than once. If you know the parents names include them. Include the location and times your ancestor lived in those locations. If information is doubtful, place a ? on the information. We will reply to your inquiry as quick as possible.